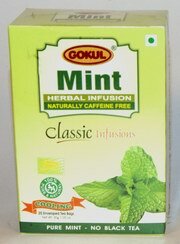 Gokul Herbal Teas are naturally caffeine free & made from finest Indian herbs & spices for cooling and give a delicious taste. A substitute to coffee & tea. Cheer your senses at any time of the day. Put one Tea Bag in a cup and add fresh boiling water. Allow it to infuse for 3-5 minutes according to strength required. For best results, always drink without milk. Honey may be added to sweeten.